It’s time to take a look at the Secret Empire. Recently Marvel has had fun bringing back old events. We got a new Civil War, Infinity Gauntlet, and even the Secret Empire. 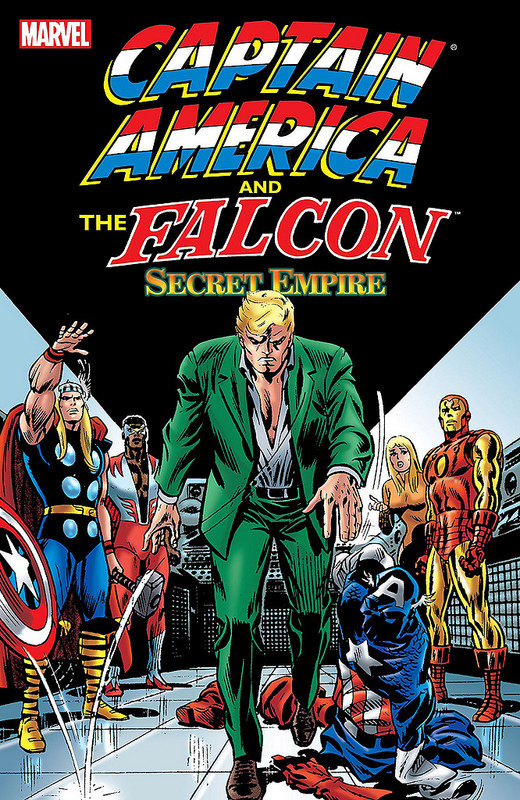 Many don’t know this but there was an original Secret Empire event which the new one is lightly based off of. Honestly, it’s very light so the plots are quite different, but it goes to show that Marvel has been doing their research. This isn’t a very good event, but it’s decent enough. The writing just hasn’t aged well in some respects. The collection starts off with Falcon being jumped by a bunch of hooligans. Captain America saves him, but Falcon isn’t happy since he’s tired of being in Cap’s shadow. Cap offers to help him get a power up through Iron-Man or Hank Pym, but Falcon wants it to be someone more relatable so he goes to Black Panther. This is only the start of where Falcon starts to act petty. He brings his girlfriend along for the ride basically just to show off and she gets competitive with the others very quickly. She picks fights with almost literally everyone she comes across and even throws a spear at Black Panther just to get his attention. Thanks to her, two of Black Panther’s guards are murdered and Falcon doesn’t seem to care as he keeps bragging about his upgrades. He runs back to show them off to Cap and is quite eager to take on the Avenger in a fight. While Falcon was gone, a smear campaign was run against Captain America on TV and it was quite successful. So successful in fact that within days the whole country was agiainst the hero, even the Avengers. It’s almost laughable how quickly Iron-Man shows up with his threats and Falcon starts to have doubts as well. Even Nick Fury quickly jumps on the bandwagon. Captain America begins to lose faith in America which is understandable but before he call it quits, it’s time to take down the Secret Empire. It turns out that they have also kidnapped most of the X-Men so Professor Xavier, Jean Grey, and Cyclops arrive as backup. Together, the heroes stand a fighting chance, but Cap may have to cross some lines in order to clear his name. The Evil Cap part is what the new Secret Empire is really going for while here it was all just bad media coverage. I think a big problem with the arc is that it all hinges on Marvel’s America being as gullible as possible. Did everyone really believe these media interviews so completely? What happened to the Daily Bugle and their reporting skills? Why didn’t the Avengers launch a campaign of their own? Why would everyone accept a new Moon hero coming out of nowhere as Captain America’s replacement? I felt like this comic took a lot of beats from the Thunderbolts but in a far more rushed and less believable scenario. I don’t know, the whole thing was rather fishy the whole time. Captain America also wasn’t at his most likable in this comic either. He basically said that he wouldn’t help the X-Men until they pointed out that it was the same villain behind both schemes. He falls for every trap that the enemies laid out because his emotions cloud his judgment the whole time. It’s easy to forget that he is supposed to be a seasoned veteran here because he rarely acts like it. He also makes the wrong decision to end the comic and this has got to be the 4th or 5th time he’s done this. I didn’t realize that he was lacking in confidence so often. He’s still an entertaining enough character to watch, but he can be annoying. Falcon is unfortunately even worse. He spends the early issues being jealous of Cap and then he rushes into battle without actually remembering how to fight. In a critical moment he ends up knocking out Black Panther and himself by mistake and tends to lose in all of his fights. Even in his big return fight where he teamed up with Cap, he lost in under 5 seconds. Naturally he started throwing petty insults at Cap after that. Falcon has just got to be the most petty superhero of all time and I’d consider him to be more whiny than Alpha from the recent Spider-Man comics. I’m glad that the Falcon has improved over the years because otherwise I can’t see why he’d stay on as a main character. Black Panther looked good here. Despite everyone rushing him and murdering his men, he stayed calm throughout and always had a plan. He was definitely useful here. Thor and Iron-Man had decent motivational speeches, but didn’t do much in the story beyond that. There is a subplot where Peggy thinks Cap still likes her while he actually likes someone else. This drama plot definitely feels like it’s out of left field. It could be resolved rather quickly but Cap is too nervous to say anything. I’m not too surprised. It’s not an easy decision of course, but he still needs to make the hero call here. As for the villains, we mainly focus on the Tumbler. He’s not half bad although you can’t help but feel like he is just Batroc by another name. His agility lets him take on guys like Captain America, but I can’t see him lasting too long otherwise. The Moon villain was more of a threat and he was someone that I could take a lot more seriously. He had super strength, speed, and intangibility. I think he could also teleport. Captain America and the others really couldn’t beat him during the issues so his fans must be thrilled. He gave the issues some more stakes as this was a villain that they couldn’t beat with brute force alone. I also liked the design. We also have the corrupt politician. He wasn’t quite as fun as Godfrey, but I liked him all the same. He did a good job of stringing everyone along in his plot. The Secret Empire members also weren’t bad although most of them weren’t actual characters. It is interesting how Hydra created so many splinter groups. It really is a dangerous organization in that sense since every major villain group seems to be connected to them in some way or other. I’m trying to figure out who the politician who destroyed himself was since it obviously rattled Cap. On one hand, I want to say that it was the President, but I suppose that would be a little too bold. Whoever it was, I still wonder why it would break Cap. Maybe they’ll say it in a future comic or maybe they won’t. The art was certainly on point. Everyone was in their ironic costumes and it was easy to go from page to page. Everything was sharp and this comic has aged incredibly well in that respect. I breezed through the issues as a result. Good art can certainly make a difference in a comic. Now, this review may have been on the negative side as I just had a lot of logic issues with the whole thing, but it was a fun comic. If anything, it just reinforces to me that the Marvel characters are still a lot meaner than the DC ones. They doubt each other and change sides at the flip of a hat. That hasn’t really changed much over the years. That said, the adventures were still fun to follow. Seeing Cap have to break out of jail and steal stuff was pretty interesting. The team up with the X-Men was a lot of fun as well and I hadn’t been expecting that. It was also interesting to see the X-Men in their extremely old costumes while everyone else looked quite a bit more modern. I believe their was a plot reason for that, but it was a fun contrast. I would have liked to have seen Cyclops do a little better in the fights, but this wasn’t exactly his rodeo. Overall, It’s been a while since I read a Captain America comic. In many respects he was portrayed well as he takes command of the situation and always walks around with a strut. That being said, his self doubts and general disregard for everyone else could be a little extreme. The Falcon was certainly extreme and maybe it was just the writer who didn’t really understand the characters. It can make the issues funny in an ironic way as you wonder why everyone is acting this way, but it is certainly entertaining through and through. There are no objectionable scenes in the comic and it never drops a random animal scene or anything else to worry about. It’s just a fun action adventure and you can’t ask for much more than that. I’d recommend checking out this comic and you may look at Captain America in a whole different way. This entry was posted in Comic Reviews, Comics, Reviews and tagged Action, Black Panther, Captain America, Comic Review, Falcon, Marvel, Marvel comics, Professor Xavier, Retro, Review, Secret Empire, X Men by dreager1. Bookmark the permalink.